Mackenzie grew up in Prescott, Arizona and attended Prescott High school. 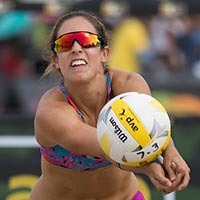 After she graduated high school, she attended Grand Canyon University in Phoenix, Arizona for 5 years and played indoor and beach volleyball for the school. Mackenzie obtained her Bachelors of Science in Accounting and Masters of Science in Accounting degrees at Grand Canyon University. 2016 Beach � Had a 21-5 record at No. 1 doubles with partner Shannon Dugan.. Named to First-Team Academic All-America Team and the CoSIDA Academic All-District Women�s At-Large Team.. Earned the award of AVCA Collegiate Beach-All American with Dugan.. Won the Gold bracket at the LSU Beach Invitational. 2015 Beach � Had a 16-7 record in the regular season.. Advanced to the semifinals in the USAV Chula Vista Tournament.. Won the gold bracket of the Sand Volleyball Showcase in Hawai�i.. Competed in the AVCA Best of the Rest Sand Volleyball Pairs competition, earning a 3-1 record to advance to the 2015 AVCA Pairs Championship.. ..Advanced to the semifinals in the championship.. Selected as a 2015 AVCA Collegiate Sand All-American. 2014 Beach� Earned an 18-4 regular season record.. Was invited to play in the AVCA Sand Volleyball Pairs Championship to go 3-3 in postseason play.. Was a member of the first pair to earn a slot in national postseason competition. 2014 Indoor-- In win over Albany, became program's first player with 2,000 career digs ... named to Lumberjack Classic All-Tournament team ... Selected co-MVP and top libero of Texas Southern Invitational. 2013 Beach � Played at No. 1 doubles all season and compiled a 3-7 record in the GCU inaugural beach volleyball season.. Partnered with Dugan to go 2-0 in the GCU Dual Tournament. 2013 Indoor -- Named to WAC All-Academic team .. led WAC in overall digs per set at 5.65 and WAC only contests at 5.33 ... With 28 digs at Utah Valley on Nov. 7, she became the program's all-time leader in digs. Currently with 1,877, she passed Laurann Durbin (2008-11), who finished with 1,730 ... had 38 digs, most by any player in a WAC match, in five-set WAC opener against Kansas City (Sept. 26) ... named to Big Green Invitational All-Tournament team ... set school and WAC single-match record with 52 digs in five-set match against Central Connecticut State on Sept. 13 in Hanover, N.H. and was named WAC Player of the Week (Sept. 16) ... Named to preseason All-WAC team ... had 36 digs in first D-I match against Weber State ... selected to Wolf Pack Invitational All-Tournament team. 2012 Indoor� Selected Daktronics, Inc., NCAA Division II Third Team All-American � Named Honorable Mention AVCA All-American � Chosen for Capital One Academic All-District 8 Team � Named AVCA All-West Region � Selected First Team Daktronics, Inc., All-West Region � PacWes All-Academic team choice � Named First team All-PacWest and league Libero of the Year � Named to GCU Invitational All-Tournament team� ranked No. 10 in the nation at 5.95 digs per set ... set single-season school mark with 661 digs ... had 30-plus digs six times. Personal: Formerly Mackenzie Phelps, she married Ben Ponnet, a volleyball player from Grand Canyon University.